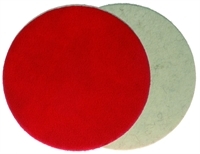 Applications: Felt discs for polishing stainless steel, plastics and lacquered surfaces. They are available in a choice of sizes and are used for final polishing along with a polishing compound. Product Notes: We offer 115mm and 125mm discs, allowing for a quick change of product, with 10mm locating holes (not shown in photo) which fix on to a small pin on the special backing pad. This ensures correct central location of the disc and minimises vibration. Slower speeds will usually make it easier to achieve a better result.